That's a shame, seems to be a fair few people complaining they can't get decent broadband due to wayleaves not being sorted out. Couldn't you just do a rolling contract with PlusNet until you got some info? If you don't sign up for a new contract, you are automatically put on a rolling contract. It was mid February when I last posted. Cables were laid back then in my area around Percy road budgens garage etc.. Been no sign of any activity since then. The grey boxes are still empty. I've been on a rolling nowtv fibre account. They seem to be the only ones offering a monthly rolling contract though they charge a one off fee of 50 quid for the pleasure. 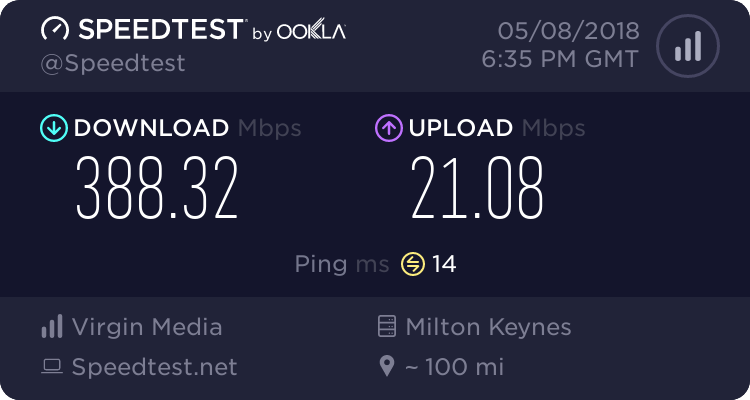 I can get a cheaper max fibre contract but have to commit to the usual 18 months and seems to be taking virgin forever to get this area live. That and the 500 page thread on the virgin community forum about problems with the superhub 3 is kinda putting me off waiting any longer. How's it going for any one actually connected? I'm using SH3 in modem mode and have no issues, the latency issue was fixed soon after I had mine installed if that's the thread you're referring to. As for speed I've tested regularly and they all been very good, I'm on Vivid 350. Perhaps CLOKent could find out what the hold up is for you. Have they rolled out the fix to all customers now though? I remember seeing your early BQM with Virgin and it was shocking. It only fixed when you upgraded to Vivid 350. That wasn't a coincidence as at the time the fix was only going to Vivid 350 customers. They seem to be the only ones offering a monthly rolling contract though they charge a one off fee of 50 quid for the pleasure. When your contact is up with a provider you automatically go on to a "rolling contract" if you do nothing. I don't know any ISP who forces you to recontract or leave. I know you lose any existing discounts but there really shouldn't be a fee, never ever heard of such a thing. edit: looking at their site the £50 to go on a monthly rolling contract should only be for new customers who don't want to sign up to 12 months. If they have charged that to you I would be demanding a refund. Assuming there is a period where you can cancel any upgrade from a lower subscription, couldn't you upgrade to Vivid 350 (if available) and get the fix, then regrade back to your old subscription within the cooling off period? Would be a hassle if this is the only current way of getting the fix onto the hub. You can see it in your post when you upgraded to Vivid 350. I know it updated then, just thought it was coincidence, didn't realise it was only be rolled out to top tier customer's. Having finally found out that my current TT contract is up on the 6th October I find that VM are still saying that my street does not have VM available. The other issue now is that TT seem to be pushing 24 month contracts which I dont really want. How long does it take for VM to activate their infrastructure once the cabling and cabinets are installed? Have you seen fibre being blown from the large cabinets to the smaller cabinets yet? Can you not stay with TT on a rolling contract? I could but it is expensive!